In case you missed it, I posted about part 1 of the Funky Lunch workshop here. The usual FunkyLunch workshop is set up as an all day event. We did it a little differently and split it into two parts. 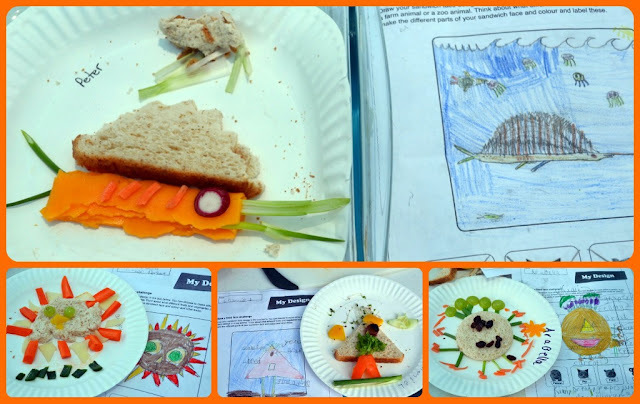 Part one was fruits, veg, bread tasting and I gave a demo.The students then had classroom time to design their Funky Faces. Part 2 of the workshop was the Creative Workshop and all of the children had the chance to make their designs. This is my daughter's kitty cat creation. It's supposed to be an angry cat. Why is he angry? I have no idea! For the purpose of the workshop we did not make sandwiches, each child was given a slice (or two if they needed) of bread to use. If these were for lunch packing then the starting point would be to make the main part into an actual sandwich and then just decorate from there. Most of the children ate their creations at the end. If you are making any of these for travelling in a lunch box you would want to use something to "glue" the features on. You can use nut butters, nut-free seed butters, honey, butter, mayo etc. It was a fabulous afternoon! Thankfully there were several other Mom volunteers who came out and helped with prep work. I went grocery shopping in the morning so that all of the produce would be as fresh as possible. When I came home it took my Husband, Mom and I a solid hour to wash everything! The location that we were using for the workshop at school was pretty far away from a good produce washing area so it made sense to have it all washed and ready to go before the prep. time. It still took all of the Moms a full hour to get the trays made up as there was quite a lot of peeling and chopping involved to make 14 trays for 116 students to share. Here are some of the creations next to their design plan. I just loved this sailfish! What a great idea and execution. I believe he was 6 or 7. These are the items that we had available for the students to use and snack on. Honey Wheat bread or Glutino Gluten Free Tapioca bread, cherry tomatoes, cucumbers, carrots, radishes, red, yellow, green & orange bell peppers, scallions, green and red leafy lettuce, broccoli sprouts, red & green grapes, raisins, muenster cheese & cheddar cheese. 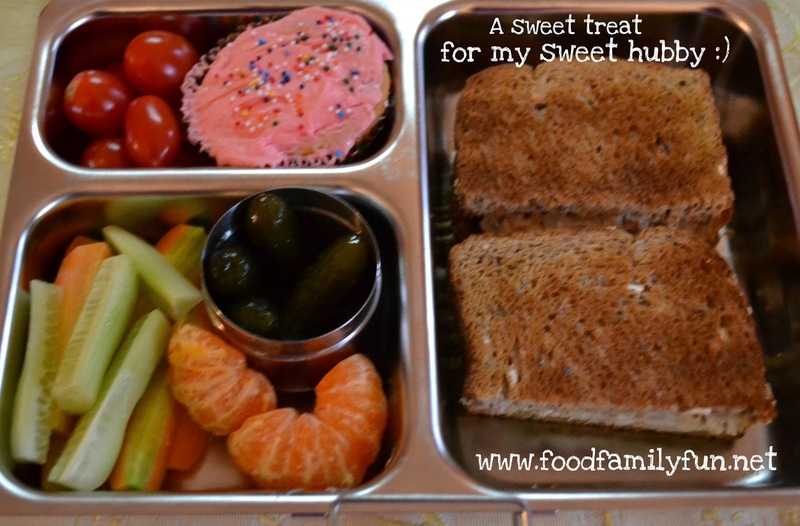 I am pleased to report that there was a lot of snacking and most of the veggies were consumed! In any future workshops I think I have a better idea of how much is needed and I can cut back some of the quantities slightly as we did end up with a few extra items. Here are some items that were made available for the children to use in their creations. If you are planning your own funky lunch workshop I also recommend these items. I will add these next time as they are the most requested cutters during the workshop. I made up a REALLY quick "Welcome to Summer" banner for the girls. They were very excited! School let out at 11:30am today and we went out for a nice lunch and then came home for a little playtime with a friend. Here's our last day of school photo - the girls are right in front of the mosaic at school. We're going to have lots of swimming lessons and do some family fun activities this summer. What are your plans? mini vanilla sandwich cookie for a treat, turkey sandwich with cheddar and muenster feature. ham sandwich with radish, cheese and ham features. School is almost out for summer break! The end of the school year is always so busy it seems. We have 2 more lunch packing days left and then a half day on Wednesday. We are looking forward to some fun, family activities and lots of swimming lessons this summer. There are 2 dolphin shaped sandwiches made using a lunch punch. Some gummy vitamins are in the little red cup. Veggies are carrots, celery and cucumbers. Fruits are strawberries & grapes. She didn't really eat the celery or much of the cucumber :( I'll still keep trying though! These cucumbers were from a pack of 5 baby cucumbers and they were really delicious. I made a quick lunch for my husband to take to work. Just a few of his favourite things all packed up in his Planetbox Launch. Have you heard of the company Funky Lunch? They are based in the UK and offer fun food workshops for schools and fun food birthday parties. For people who are not lucky enough to be in their area, you can order a workshop kit and deliver your own funky lunch workshop at your school. The kit gives you all sorts of information, worksheets, tips and even a full day lesson plan. I brought the Funky Lunch workshop to my daughters' school and last week I gave part 1 of the workshop to 116 children aged 6-9. 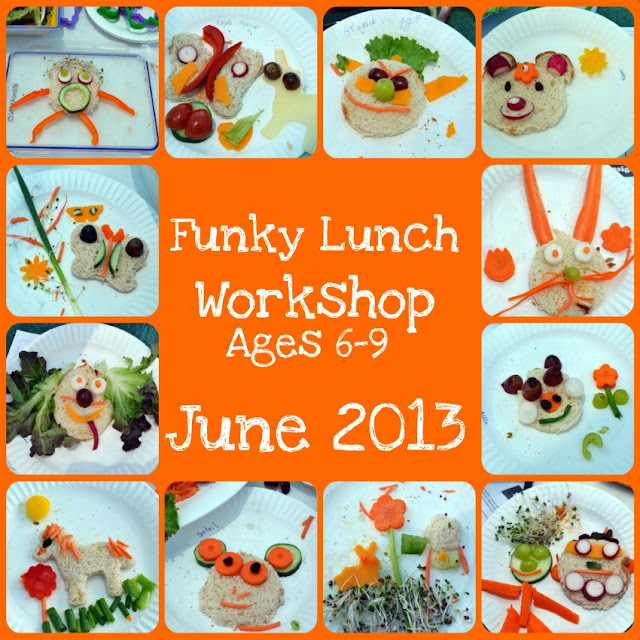 You could make a whole funky lunch workshop day but we chose certain parts and split it into two sessions. For part 1 we had parent volunteers and teachers help with a bread, fruit & veg tasting and then I did some demonstrations of a funky face and gave a little introduction to the activities of part 2. I didn't have a chance to review all of the results of the tasting (we ran a bit short on time so the teachers kept the notes for class review) but I was chatting with them as they rotated through to my station. Almost everyone said that they had tried something for the first time that morning, and many said they discovered that they liked a new food. I was pretty busy during the workshop and didn't have a chance to take any photos myself. I do have one photo of a finished demo that I made last week with the children. A friend emailed it to me - Thanks Tali Gabai-Maiato! I think it ended up being the best demo. It was MY favourite anyway. 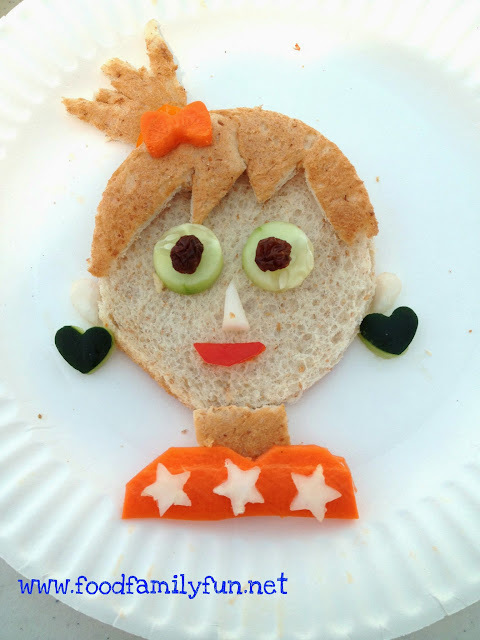 Funky Face girl made with - bread, radish, cucumber, carrot, orange pepper, red pepper & raisins. There children were split into 6 groups so I made 6 demos. This girl was the last one. I asked the children for input as we went. They had lots of great suggestions - we should put a carrot bow in her hair, we should make radish ears - use the heart and then cut it in half to make two ears, We should use cucumber hearts for her earrings etc. They were having fun and I have to admit that I was having fun! The only tools used were a knife, and some cutters - 2 sizes of circles, heart, star & a mini bow. I also made 2 aliens, a kitty cat face with a cherry tomato mouse, a butterfly with some flowers and a clown (like in the actual funky lunch demo here). You might notice that this isn't an actual sandwich. For the workshop we are only using 1 slice/layer of bread for the faces. 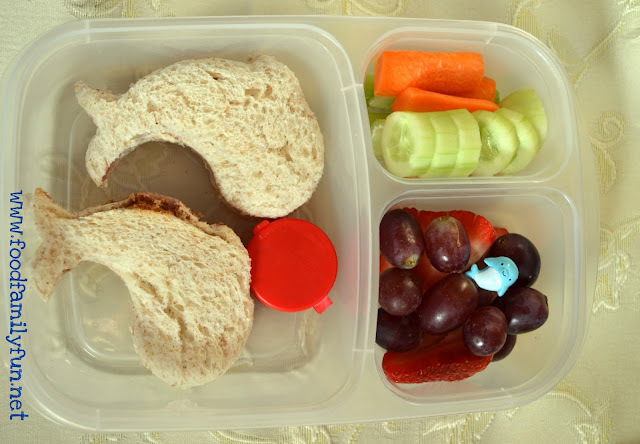 If you wanted to pack this for lunch you would make the circle part of the face into a sandwich of your choice and then use either honey, peanut butter (or nut free butter) or similar to "glue" the embellishments to the sandwich. Tomorrow I am giving part 2 of the Funky Lunch workshop I think this is going to be the REALLY fun part! The children have now had the week to design their funky face sandwich and tomorrow they get to make them. During the demo I discussed all of the food choices that they will have available to use tomorrow. We'll have bread, carrots, cucumbers, red, orange, green & yellow peppers, scallions, broccoli sprouts, red and green leafy lettuce, radishes, cherry tomatoes, red & green grapes, raisins, plus cheddar & Muenster cheese. I can't wait to see what they come up with! Hopefully I'll be able to take lots of pictures this time. If I manage to take some photos of their finished creations, I will certainly share them on the blog (not the kids, just the food! ).There is a a bit of prep work to do before the workshop tomorrow. A little peeling, slicing and organizing all of the items on trays for the workstations. There were several really great parent helpers last week, I hope they are all coming this week too!